My dear friends, brothers, sisters, my elders and well wishers of Pakistan. This cricket blog is turning into a new blog from today. As we have decided to change the course and the subject of our discussion from cricket to cancer. 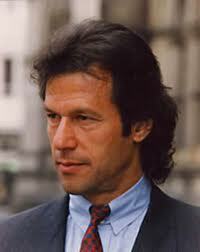 We all know that our cricketing hero Imran Khan has been targeted by a few of the opposition political parties. I have never been into politics in my life and I have no desire to be in it ever. The only reason I am writing this blog is I watched this video, which is so ugly and so disgusting and it provoked my conscience and I am sure a million other Pakistanis must have thought the same as I. After watching the above video in which Kh. Asif has shamelessly accused Imran Khan for misappropriating the funds of Shaukat Khanam Memorial Hospital for his personal use, I have taken this task to mobilize One Million US dollars for SKMH with the help of my on-line friends and followers also from those who are not my followers. And, I shall also be using my personal contacts and friends all over the globe to help us in this noble cause. Initially this may look like an impossible task maybe some people may laugh at me or make fun of me. I am least bothered about it. Trust me my friends with hour help and with the help of Allah Almighty this is not difficult to achieve. As a banker I have taken much bigger tasks and targets in my banking career and not only achieved them but surpassed them. All we need is a first step followed by the second and the third for no one can climb a mountain with one giant leap. Please do not under estimate your power – the power of the people and with the power of twitter, face-book, emails, blogs sms and most importantly the word of mouth, we all can definitely achieve this target, Inshallah. Charity begins at home, I will be the first one to start with a humble donation of $1000. I am not trying to be a show-off here, I can afford to donate this money and I will donate it, may Allah give me even more money and resources to increase my contribution further. I shall be very happy to see even a ONE DOLLAR contribution from you because, an ocean is made of drops and your contribution will be more important than many others who are very rich. No man is so poor as to have nothing worth giving as well might the mountain streamlets may say they have nothing to give to the sea, because they are not rivers. Give what you have, to someone it may be better than you dare to think. So give, give generously, give according to your status or your will and your desire to give. This is not a trot and, we don’t want to prove it to anyone that we are doing this in retaliation to Kh. Asif & co. We should consider this as an opportunity to rise above all the other trivial people who are involved in mud-slinging on Imran Khan and trying to challenge his honesty, integrity and loyalty for the country. They are doing this because they themselves are very corrupt and they have amassed billions of rupees through illegal means and they have kept their illegal money in off-shore banking accounts, they have cheated and looted the country and deprived the poor people from the basic needs of life. Now when they see that Imran Khan is going to bring a revolution in the country they are stooping so low by going on TV channels and splattering filth. This is their job, this the best they can do. They know this will be the end of their era of corruption so they are scared and doing every thing possible they can to spoil the reputation of the hospital and more than that of Imran Khan in particular. We don’t want Imran Khan to say anything against them. Like, as a cricketer he used to say: “the best way to silence your opponents and your critics is to perform and win.” At his level Imran Khan is performing and we as a part of his team, as well wishers of Imran Khan and as good citizens of Pakistan, we need to do this job not just for him but, for the country and for the people of Pakistan more so for the cancer patients who need this money most. Let these people blab that Imran Khan has transferred the zakat and charity funds abroad and placed it in off-shore banks for his personal benefit, because they will not stop criticizing him. They are blabbering this because, themselves they have done this, they have acquired illegal wealth by hook or by crook and they think every politician is like them. If a purblind nocturnal mouse sees not the sunlight, it is not the later to be blamed. But you my friends you now have a leader who has a vision and through him you can see not only the evil intentions of his opponents but, beyond that. And beyond that is our dream and our hope to make Pakistan a better country to live. Let us make this dream a reality. With your support, we should be able to achieve this target which will be a beacon of light, a ray of hope for the cancer patients that together we can do it and, I am sure we will. Then, it will be a proof from the people of Pakistan wherever they maybe in Lahore, Karachi, California, Dubai or Montreal that Imran Khan is a leader of all the Pakistanis who are living within the country or, abroad. Please do not doubt about how we will raise and collect this money and how we will transfer the proceeds to SMKH? We will ask Imran Khan and PTI to provide us bank account details of SMKH in Pakistan and abroad and even if needed we will ask our banker friends in Pakistan and Dubai to help in opening an exclusive bank account of SMKH at different locations only for this purpose to collect the money and transfer it to SMKH. Will this be a slap on the face of these ugly people? No, they don’t even deserve a second look, so why should we slap at them? WE need to advise people through this blog or, through twitter and facebook, so that we bring awareness among people to defend our leader Imran Khan, he is respected by a majority of the people of Pakistan and he is the future hope for us for making a new Pakistan. 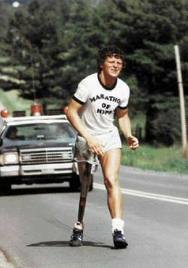 If Terry Fox can run a marathon on one leg to raise funds for cancer research, you are 170 million and the immediate goal is only $1 million. I hope you all will agree on launching this campaign, if you do then you will see it will create ripple effects and the message will be conveyed to millions of people all over the world in just a few days. So, brothers, sisters and friends please join us in this noble cause i.e., to raise funds for fighting cancer. SMKH is doing a wonderful job, they need your support. Even if you do not wish to contribute any amount, at least forward this message through emails, twitter and face book. This appeal is for all the 170 million people of Pakistan minus the handful of political miscreants, the crooks and criminals. We don’t need to say Pakistan Zindabad or Imran Khan Zindabad. We simple need to work honestly, sincerely and truthfully. I would like to thank you all and congratulate you all in advance because I have faith in you all, together we all can do it. Inshallah. You may start writing your pledges on the blog and collection of funds to be done later by authorized bankers and we will advise details later. Please be honest, sincere and loyal and please do not make fun of this or write jokes, this is very serious. We are talking about cancer and God-forbid, it may happen to anyone of you or your friends, relatives, colleague neither you nor I shall be spared from this dreaded disease. Say YES and, be positive, spread love and not hatred. I am posting my photograph here on the blog for you to know that its me and I am real, my name is real.